Intriguing collaboration this. Dave Ball was of course one-half of sleazy electro-pop duo Soft Cell and latterly performed with Richard Norris in the electronic group The Grid. On Photosynthesis he teams up with Jon Savage, no not the author. Jon Savage is responsible for the Roland Fantom X6 synths, East West keyboards, Cubase programming and digital recording here, while Dave Ball lists the Mini Moog, Sequential Circuits Prophet 5 and other analogue instruments and pedals as his equipment of choice for Photosynthesis. 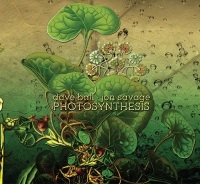 Dave Ball gave a clue to how Photosynthesis might sound in a recent interview when asked by The Electricity Club as to what floats his boat musically these days, he responded "Messing about with modular synths". Photosynthesis picks up on this updating synthesizer music from the seventies and eighties using modern recording technologies. I'm really impressed by the sound the duo create here. There's a concept behind Photosynthesis too. As they told Cold Spring, "Sitting in the garden surrounded by trees and plants on a sunny day, the idea of organisms using sunlight to synthesise nutrients from CO2 and water became an inspiration to us. This idea, juxtaposed with mankind's destruction of the planet through pollution and war gave us the inspiration to compose this soundscape". The music in itself acts a process; indexed as 8 tracks it plays as one continuous soundscape. 'One Night In Helmand Province' drifts with waves of deep reverberating synths, oscillating synths and glistening sparkles. Distant transmission samples surface, muffled and unintelligible, amidst the enveloping spacey textures that are dark and dystopian. You can hear it in the murky, industrialised tones shot through with the roar of jet fighter engines. Even the flickering sequences resemble the whirl of helicopter blades. Apocalypse Now seems an obvious reference point but here it is carefully subdued and more akin to an ambient vision of a cinematic warzone. The tension in the air doesn't last long and is quickly dispelled by the tonal tweets approximating the sound of singing birds alongside the tranquil chiming synths and buzzing drone of 'ATM#1'. While there's hope to be found in the atmosphere created by 'ATM#1', a sense of desolation runs through the drone hover and pulsing hollow tones of 'ATM#2'; capturing an austere greyness similar to the eighties industrial sounds of Konstruktivists and TG at their bleakest. 'Hypodermic' is even more spacious; its dark, shifting drones, giving way to shivery sequences that burrow deeper into airy blank tones and a stillness interrupted by synthesizer fluctuations. Electro drum rhythms surface for the first time on 'Liquid Skyliner - Zeitgeist' but in keeping with the overall theme; they're subdued and unhurried. As synths moan and waver in high registered frequencies, static in the form of an electronic sequence fizzles in the air, closing on an extended passage of disembodied keys. Although Photosynthesis runs as one long 56 minute soundscape, the splits in the following tracks are almost indiscernible, segueing seamlessly into each other bringing to the surface the "quasi pop/classical pieces" that initiated the collaboration. 'Passing Cloud Factory' opens to a rush of queasy, processed electronics, shifting from dive-bombing abstract analogue sweeps into solemn orchestrations and further into the quiet melodic chimes and oscillating textures of 'The Process'. The final piece, 'Dead Neon', casts melodic strings dripping with an enchanting watery allure, against a subtle buzz drone. It is serene and quite beautiful, and that's before the swell of gentle orchestrations adds another layer of grandness. The entire things is filled with a sense of tranquility and reverence. 'Dead Neon' acts as a lament for nature, a beautiful world marred by pollution and war.